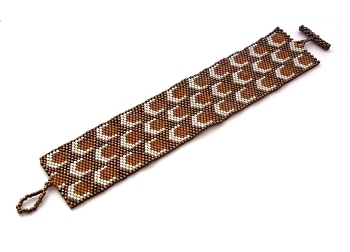 Part of my new 'Inspired by' series of work, this bracelet was inspired by a patterned scarf I bought. I loved the design which featured on one side and wanted to make a peyote stitch bracelet to match. I played around with some beading software and colours until I came up with the right combination and pattern. You can see the finished bracelet next to the scarf here.